After reading through some back issues of Steam Chest I came across an article on narrow gauge engines that might be suitable for 2½" gauge. I have to admit that I have never been interested in narrow gauge engines but I could see the point of being able to have a larger engine while still being a 2½" engine. Driving wheel dia. : 2½"
Trailing wheel dia. : 1½"
Cylinder bore : ¾" and stroke : 1 1/8"
Boiler pressure : 100psi max. Grate size : 2½" x 3½" approx. I chose the long water tanks as they will add weight in the right place over the driving wheels and as it is a narrow gauge engine these tanks are quite wide. I think that the circular type boiler, although I have not seen one on a 2½" gauge engine, will be easier to make and will also use stock tube. The wheels, dome and smokebox door are Tich, cylinders and eccentrics are Eagle. I added the trailing wheels as these were added in full size practice to make the engine more stable - and I hope it has the same effect on the model. I am building the engine as I go along and then drawing up what works best. The design may not appeal to the scale modeller, but it is intended more as an easy-to-build one and hopefully a useful running one (ie a start for a budding new Association member, perhaps !) I have been asked if I have a name for the loco, Dennis Gadsby has called his Goliath, when I first finished the loco I decided to call it Tobyafter my son. With the exception of two, all castings are available from the Association - the two being the chimney and dome cover, available from Reeves(2000). A Data Pack has been compiled, containing all the constructional articles published in Steam Chest, together with all 33 drawing sheets. Steve Eaton's Toby can be regularly seen at exhibitions and rallies. Having gained useful experience with Toby in service, Steve has built a second model from the drawings, although this version has different side tanks. 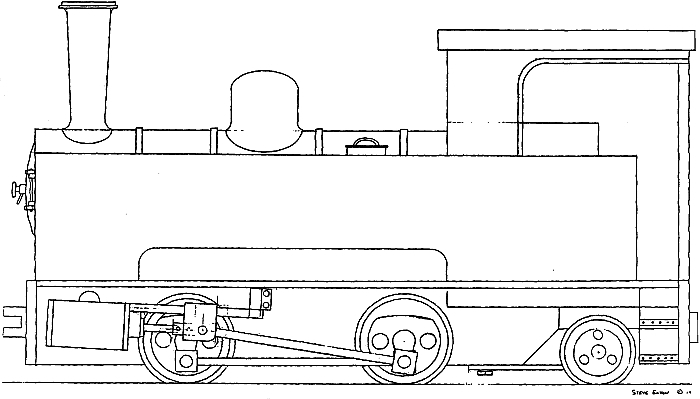 It is expected that this version will appear in The Model Engineer magazine in 2005.